Hello, sweet friends! The last few months here at the farmhouse have been a complete whirlwind, from a major kitchen renovation to writing my first book. I’ve been consumed with these massive projects, but today I’m going back to one of my very favorite methods of decorating and DIY. I’m turning something old and unwanted into something new and beautiful for our home, and I’m doing it for less than $50! 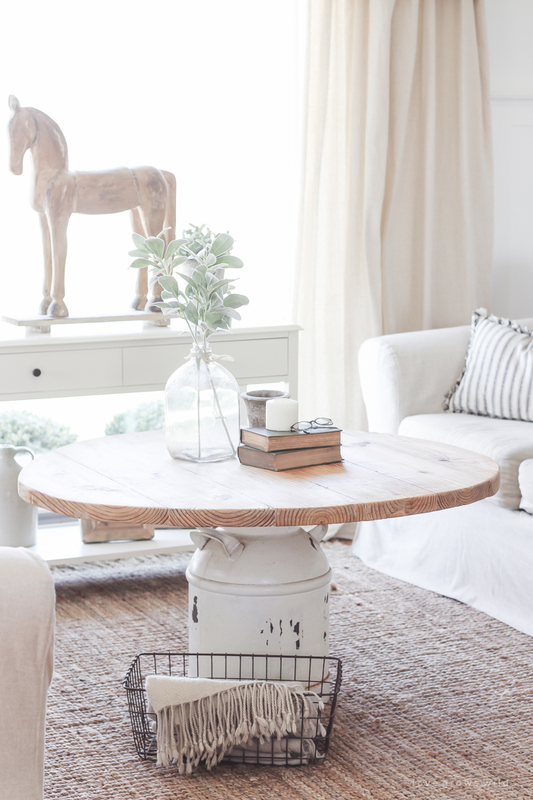 Take a look at our beautiful new coffee table. This week I spent a glorious afternoon sipping on some Starbucks and shopping around the thrift stores and antique stores in town. 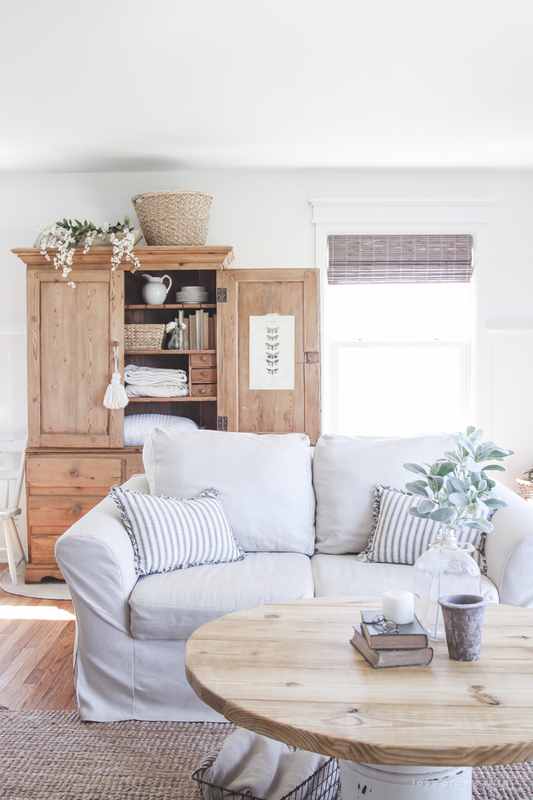 I walked past old chairs with floral fabric, dressers with years of wear and tear, lamps, window frames, and a few benches, but nothing really caught my eye. I wandered up to the top level of the old antique warehouse where they keep the stuff that doesn’t sell and stumbled across an antique milk can hiding underneath a crooked formica tabletop with a random hook attached. Say what?? I literally giggled the whole way home at my awesome score while Jeremy rolled his eyes at me. I was ecstatic! Once we got home, Jeremy pulled the formica top off, which was attached with screws to the metal lid. 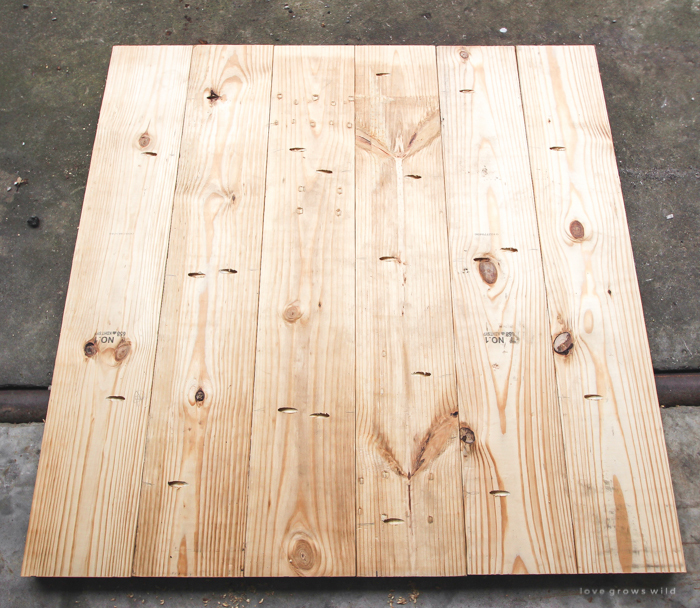 Then I made the wood tabletop by joining together 6 – 2 x 8 boards cut to 44″ long. 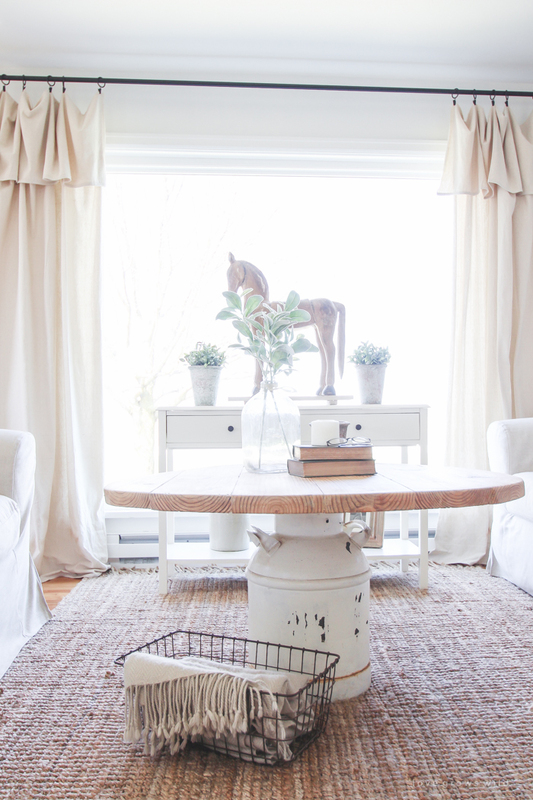 I used this method when we built our farmhouse dining table, and it works beautifully! Once I cut the boards to size, I drilled pocket holes along the edges using my Kreg Jig. Then I applied wood glue along each board edge and connected the boards together using 2 1/2″ Kreg screws. The beauty of using pocket holes is that all of the screws are hidden underneath the tabletop, and the joints are nice and strong. Then I drew a large circle centered on the tabletop and cut along the outline with a jigsaw. To draw a perfect circle I first tied a piece of string to a pencil that was half the size I wanted my circle to be (a.k.a. the radius length). Then I tied the other end of the string to another pencil. I placed one pencil in the center of the wood and drew a circle with the other pencil using the string as a guide. It was a bit difficult to cut through the thick 2 x 8’s with my cheap, little jigsaw, but once I sanded the entire piece, the edges smoothed out beautifully. I stained the wood with Minwax Weathered Oak stain and sealed the wood with a layer of natural paste wax. I was a little worried at first that it would be too tall for a coffee table, but I think it works just fine in our living room. 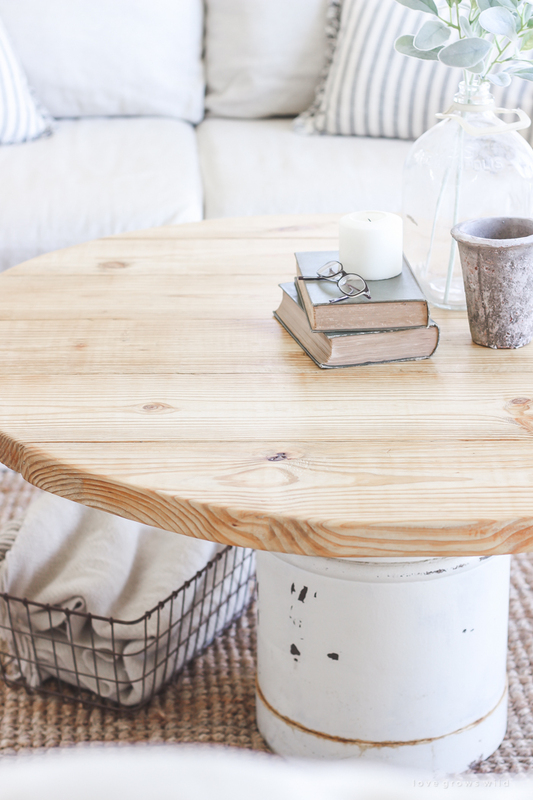 I love the chippy white paint on the milk can, and I love even more that I was able to make a new coffee table for just $20. $2.14 for the milk can + almost $18 in lumber and screws! I have to laugh because I think I’ve changed our coffee table more than anything else in this house over the last 4 years. 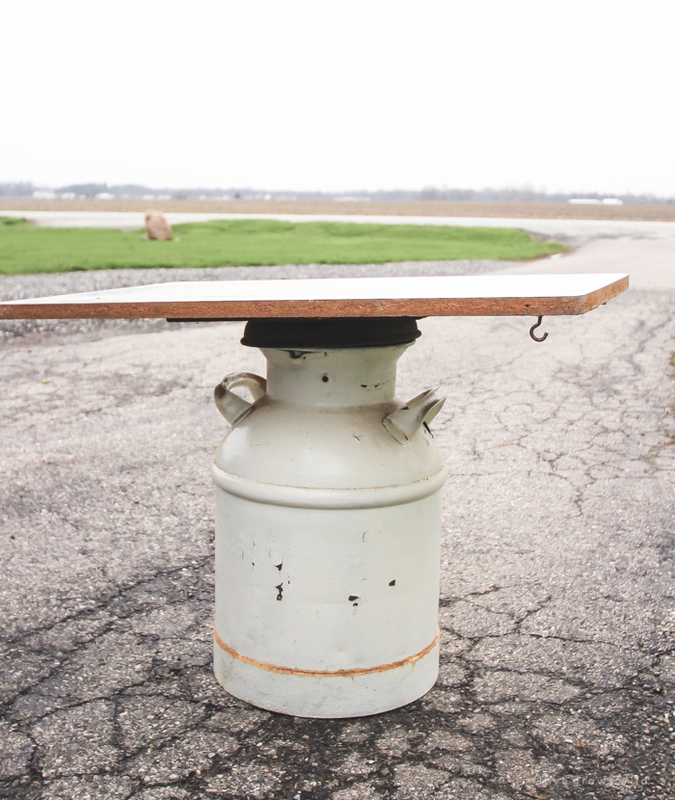 First there was the farmhouse table, then the blueprint cabinet table, and now this milk can table. I think I’ll keep this guy for awhile! This project is proof that sometimes you have to look beyond the outer appearance, especially when it includes formica. 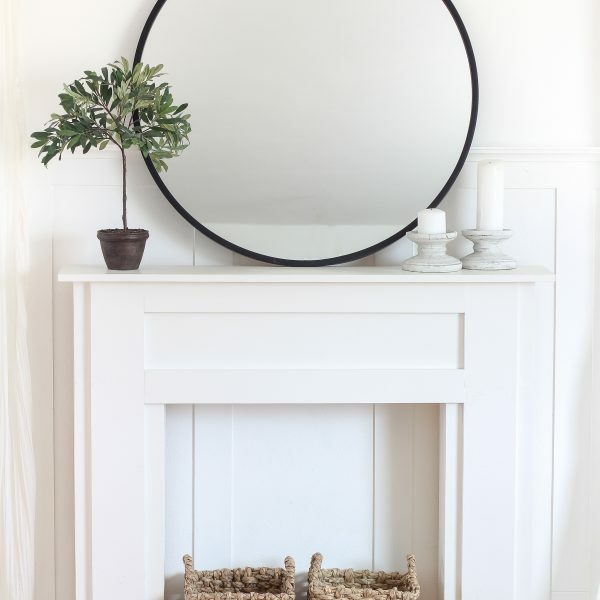 Can you tear it apart and repurpose some of the items? Can you paint over the old finish? There are so many ways to give new life to old thrift store finds, and this week a group of fantastic bloggers are showing off their Thrifty Under $50 makeovers. If you came here from Beneath My Heart, welcome to our farmhouse! Head on over to Ella Claire to see the next makeover! Surprised how much I like this, but it looks really good in the room. What a great idea! I have an old milk can outside that would be great for a project like this!! Thanks for the inspiration! 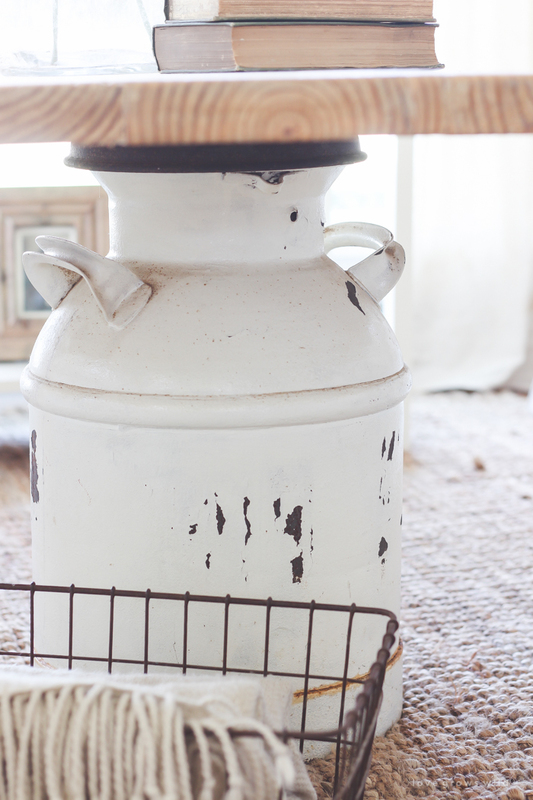 Hi Liz – Your home is beautiful and I love how you repurposed the milk can into a table. It goes perfectly in your room. Hi again Liz – I went to Home Depot online where I initially saw the blinds in Driftwood, but they were out of stock a few weeks ago. I just checked again… and the blinds are back in stock. YAY! Yours looks great. 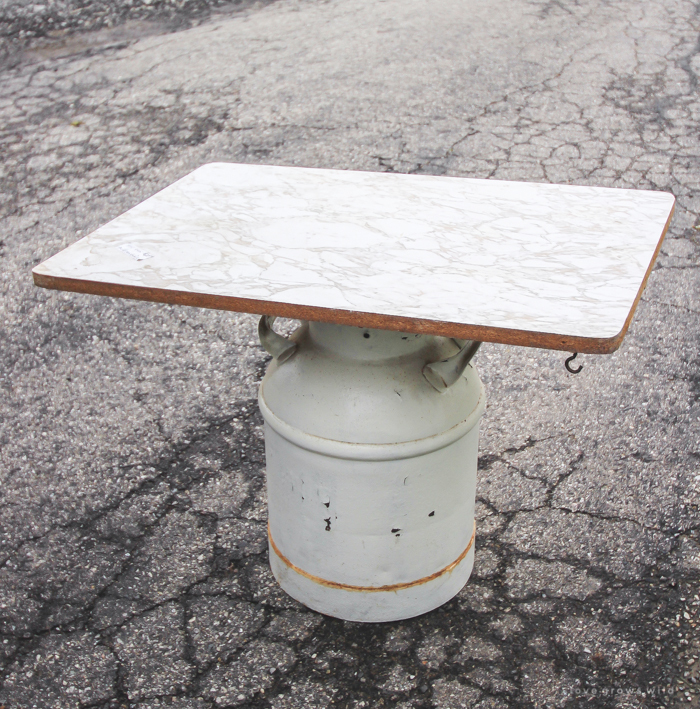 Your milk can table is so unique! I love it. You might have mentioned how you attached the top to the milk can, but I missed it. Please tell me how you did that. Thanks you genius girl!! This is brilliant! I love it. 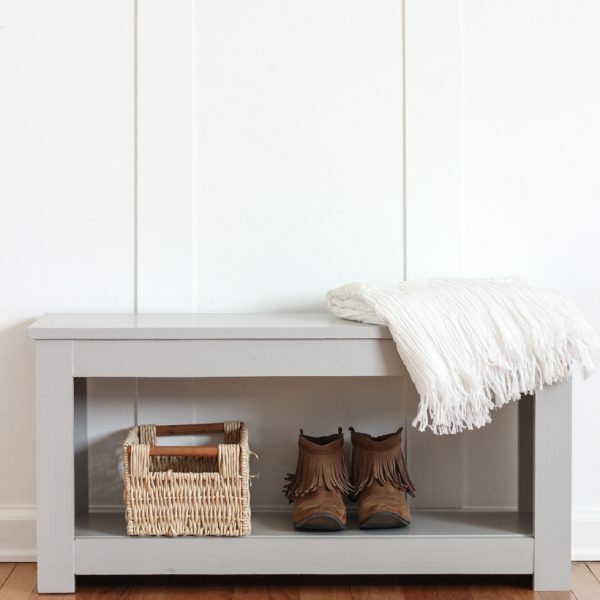 What a creative table base and gorgeous transformation! Thanks for participating in the Thrifty Under $50 challenge! 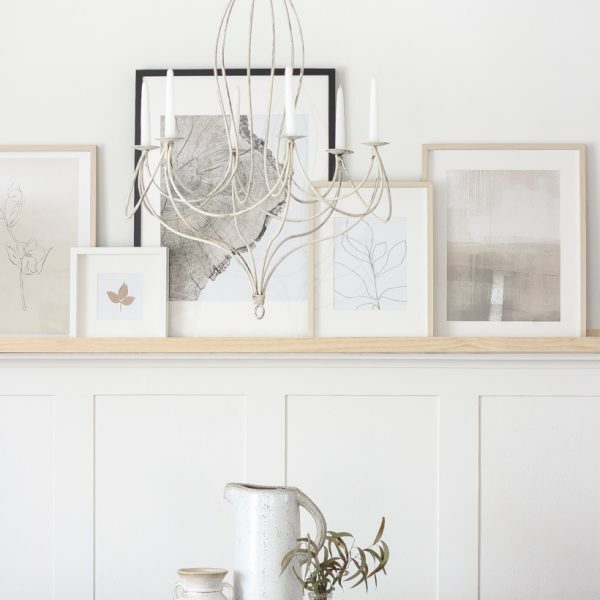 Love this idea and it looks so beautiful in you room! Just lovely! Can you tell me where you got your horse statue sitting on the table. love it! They usually have good sales, so keep an eye out for one! Liz! I love it – especially that wood top! It’s beautiful. Beautiful transformation! I love how creative your project is! What an amazing makeover! 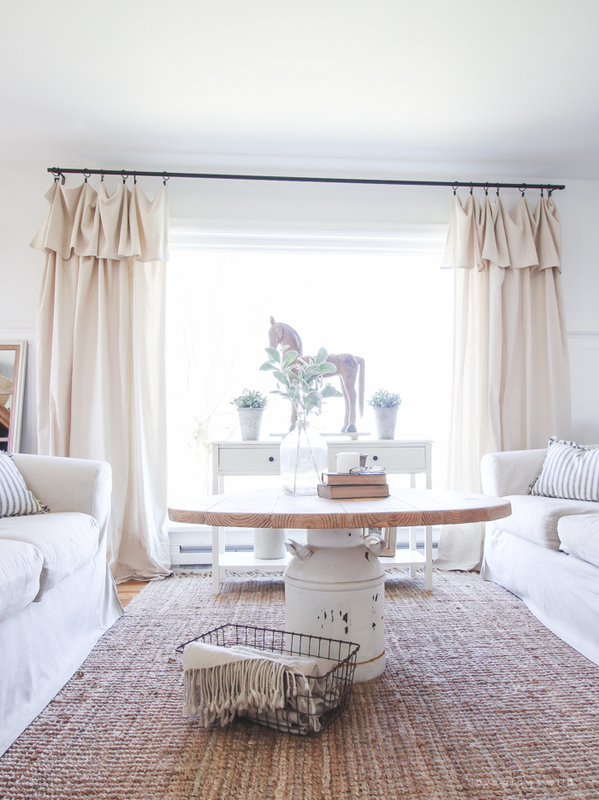 It is the perfect table for your farmhouse living room love your style, Liz. I just love your house! I was wondering if you have any info concerning your curtains in the living room. Thank you so much! I actually made the curtains myself! I have a tutorial for them in my book that is coming out this year, called A Touch of Farmhouse Charm. You can pre-order it here, if you are interested! Love the table! It may get actually be nice having it a little taller. We removed our coffee table because it was just at the right height that our German Shepherd’s tail would swoosh everything right off the table. Is your table a little “tipsy”? Such a creative idea, Liz! And I’m so jealous that you found a fantastic milk can like that for $2.14! 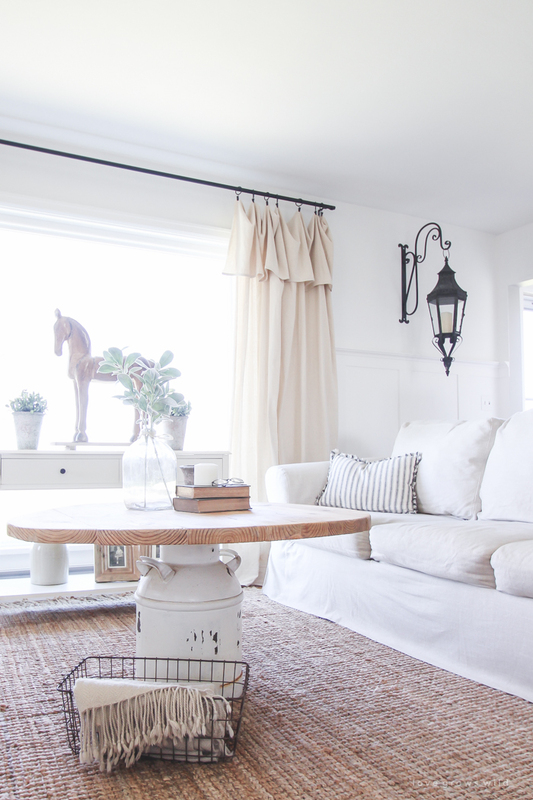 It is a stylish new addition to your already gorgeous living room. Super cute. Isn’t it awesome how almost anything can become a piece of glorious furniture. It just takes some imagination…and a dose of good taste – that formica had to go. Awesome score… it is so beautiful! Totally outside the box and brilliant! 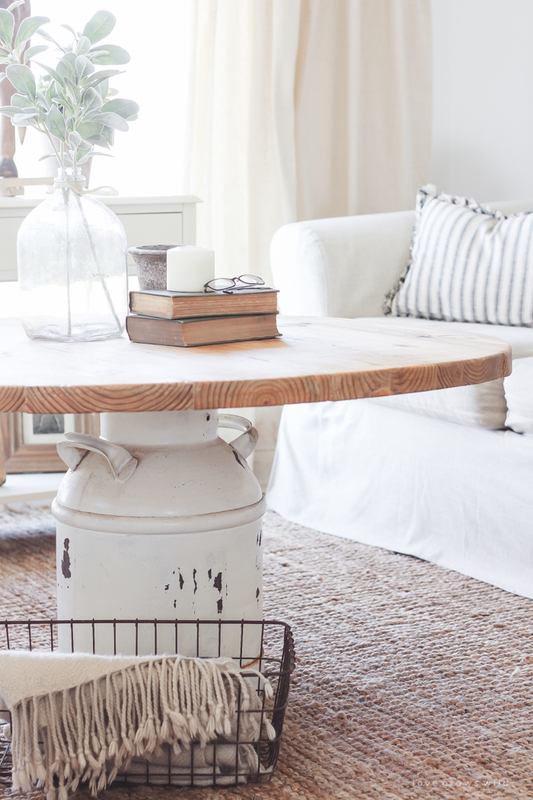 Am so loving your coffee table, gotta love how you re-purposed milk can. You have a great eye, going upstairs in that store was meant to happen and for you to find milk can. Building the top was genius, love the round top and how edges of boards look too. Can do lots on that nice big top including having dinner, play cards or board game,etc.. You are one handy talented gal. And what a price for can, perfect. So glad you got can, was really meant for you, good karma. Enjoy your new table and have great week. I’m always amazed at your visions of creativity, your hard work & the beautiful projects you create. 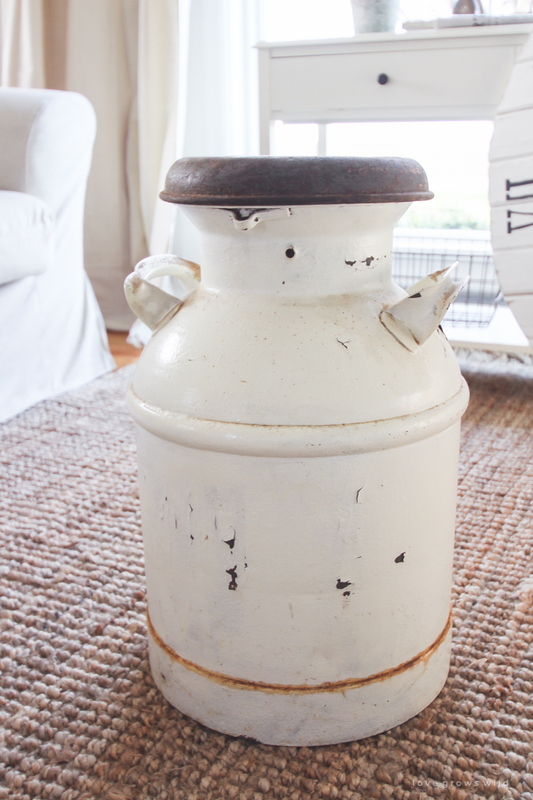 I love this I am looking for ideas to use the antique milk cans that I recently purchased to create a enty/sofa table. 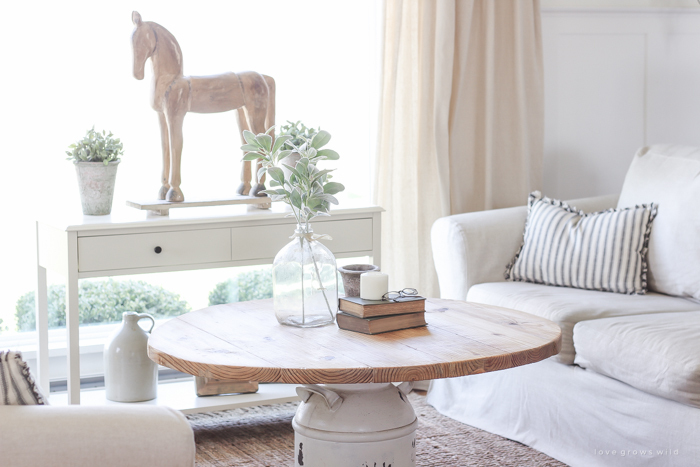 This has given me inspiration .I was thinking I may use an old door or some old barn wood for the top .Any thoughts? NEWBIE HERE. Love the look! Could you tell me please the dimensions and weight of milk can? Did the metal lid screw into the milk can? What were dimensions of circular formica top? When you got it, there were ALREADY holes in the lid — if there were not, what size hole? Did you use a screw, from underside of lid, into table top? Thanks! PS Not sure what to put below in “Website” box.